I hope you all had a spectacular Christmas. Mine was pretty darn special. I hosted breakfast at my flat, so my parents, my brother and his lovely girlfriend all came over for a bite to eat. Before long, we were joined by my mum’s best friend and her partner and one of my best friends, Adam. We opened presents and ate fruit toast and croissants. It was delish. 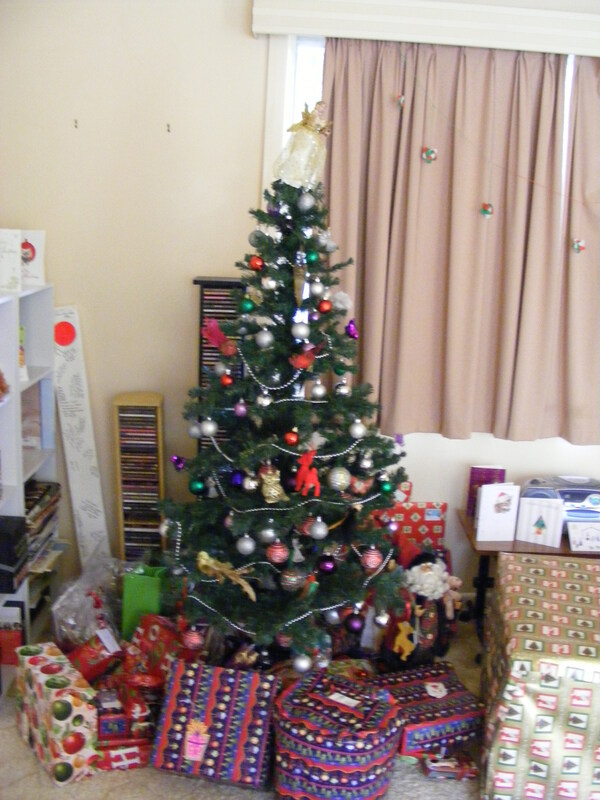 The tree, after Santa’s visit. Look at all those gifts! 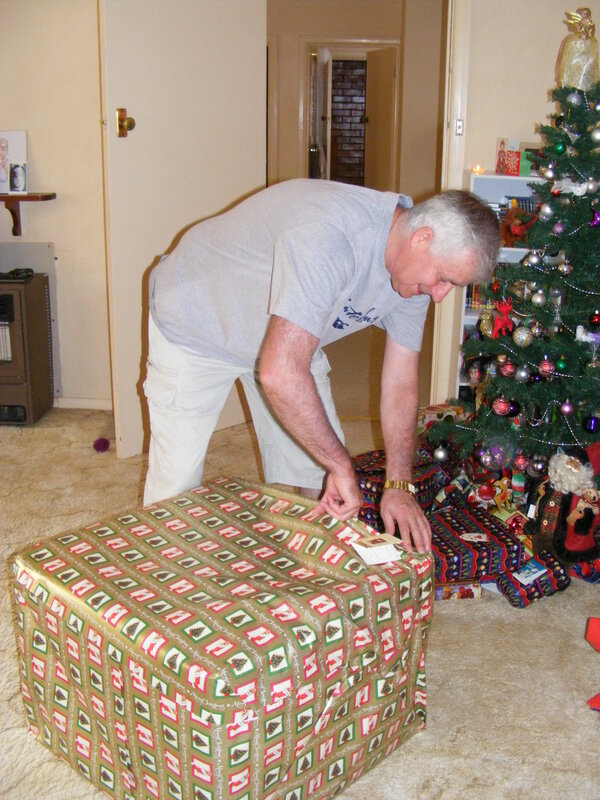 My Dad opening the biggest present of all. It was a compost bin from my mother. My dad is really into gardening and outdoorsy activities, so this was a great present for him. 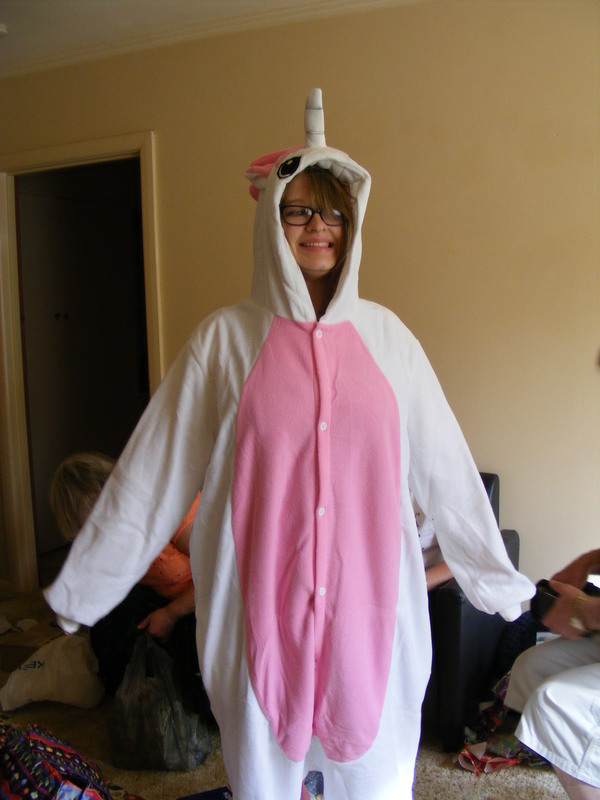 My brother’s girlfriend wearing the unicorn kigurumi I bought for her. It was already pretty hot by this stage, but she wore it anyway. Bless. 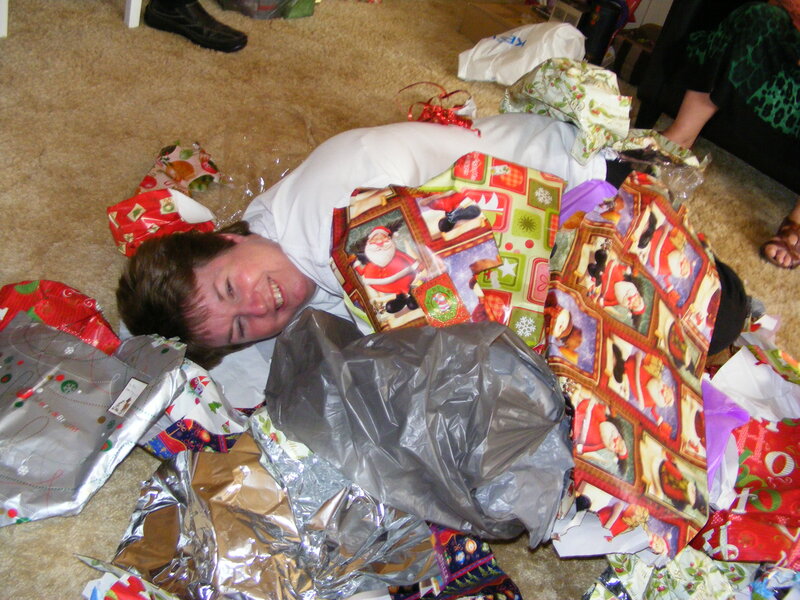 Mum decided that she was too sleepy to eat breakfast and opted for a Christmas nap in the wrappings instead. After we had showered and dressed we headed over to my aunt’s house for lunch. Every year my aunt Pauline makes the most incredible Christmas feast. We start with a seafood platter of prawns, crabmeat and scallops and salads. Then we have roast turkey, pork, beef, chicken and ham with vegetables and gravy. For dessert there was a choice of berry cheesecake (my favourite!) Violet Crumble cake or sticky date pudding. It was truly spectacular. 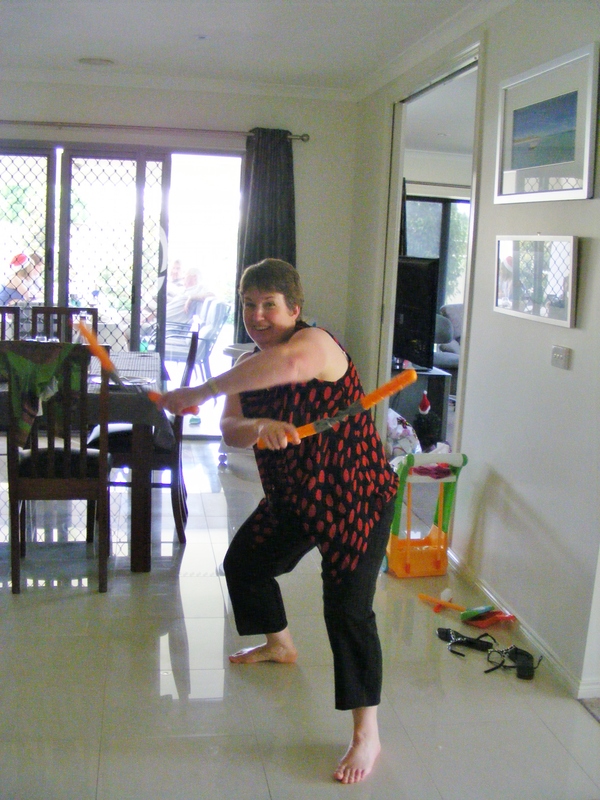 Apparently the family that ninjas together, stays together…. After lunch I headed home for a long nap, which was followed by a round of Cards Against Humanity with my brother, his girlfriend and our mate Adam. It was a truly great Christmas. I also got some awesome pressies! Want to see? 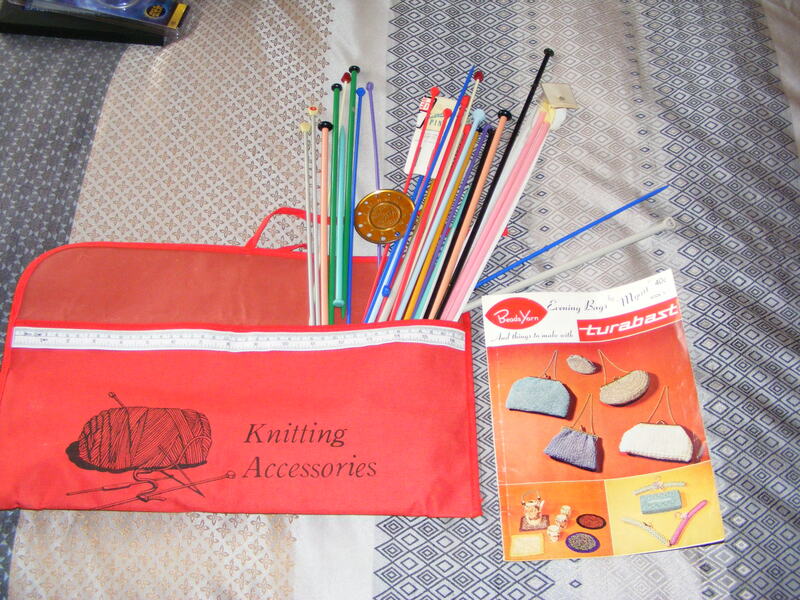 My aunt Jenny had cleaned out her knitting and crochet supplies and gave me a huge stash of knitting needles and a beautiful crochet book. I can’t wait to try some of the gorgeous patterns! 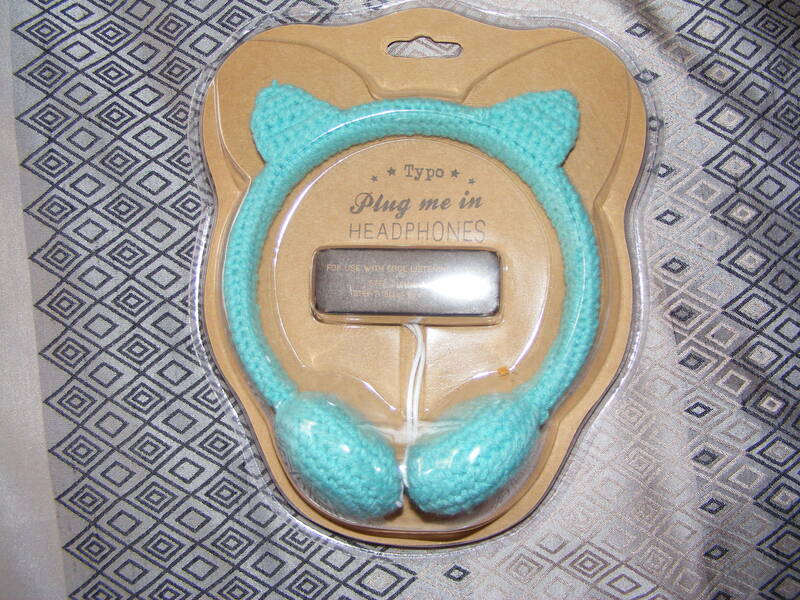 My mate Adam got me these fab cat-ear headphones. I love them so much. 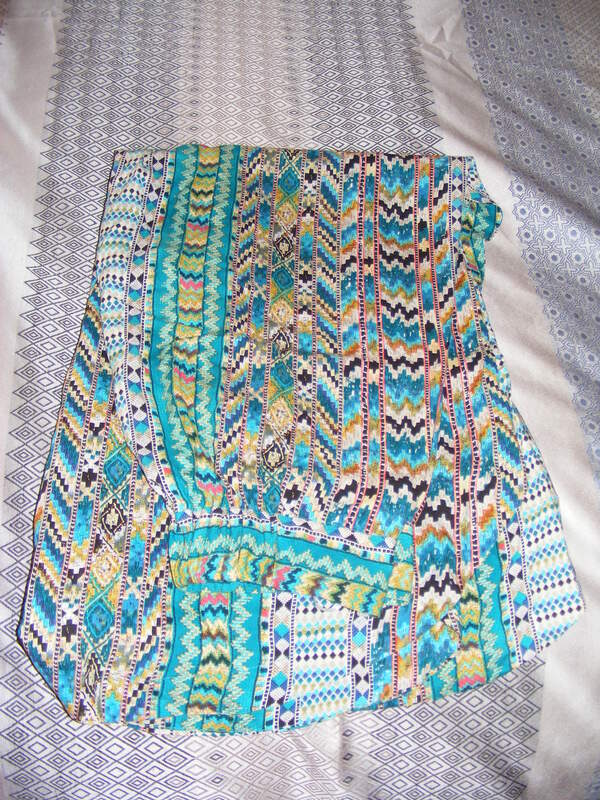 These beautiful flared pants were from Mum and Dad. I can’t wait to wear them, but they’re a bit too long so I need to take them up first. 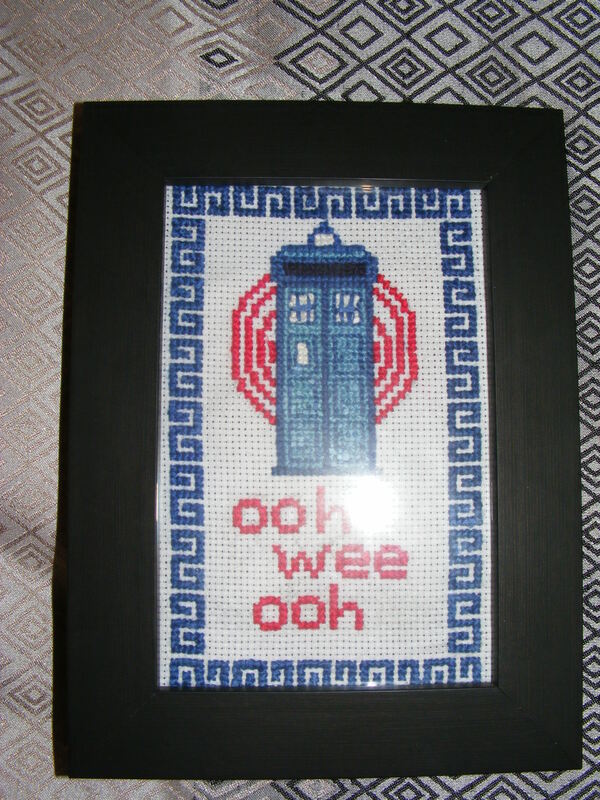 My brother’s girlfriend made this amazing TARDIS cross-stitch. She also gave me a Dalek book light. I think this might have been my favourite present. 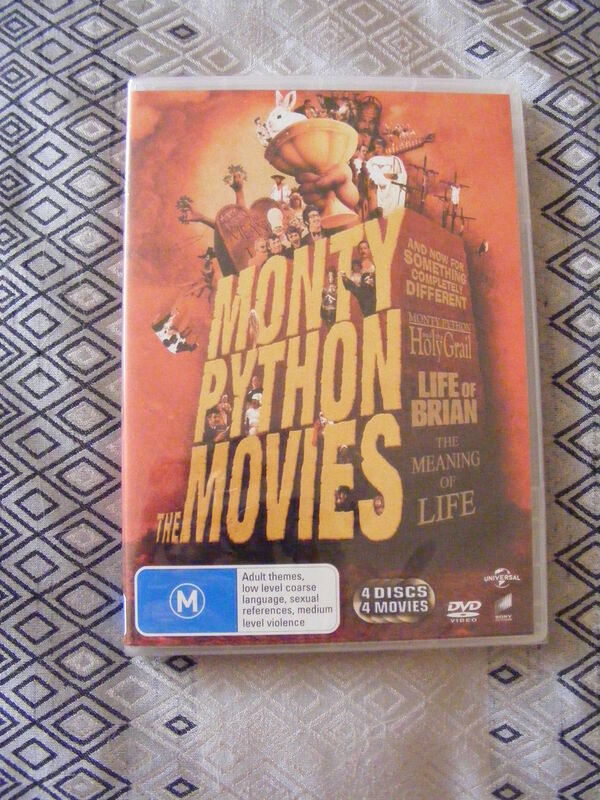 Dad picked out this set of Monty Python films for me. 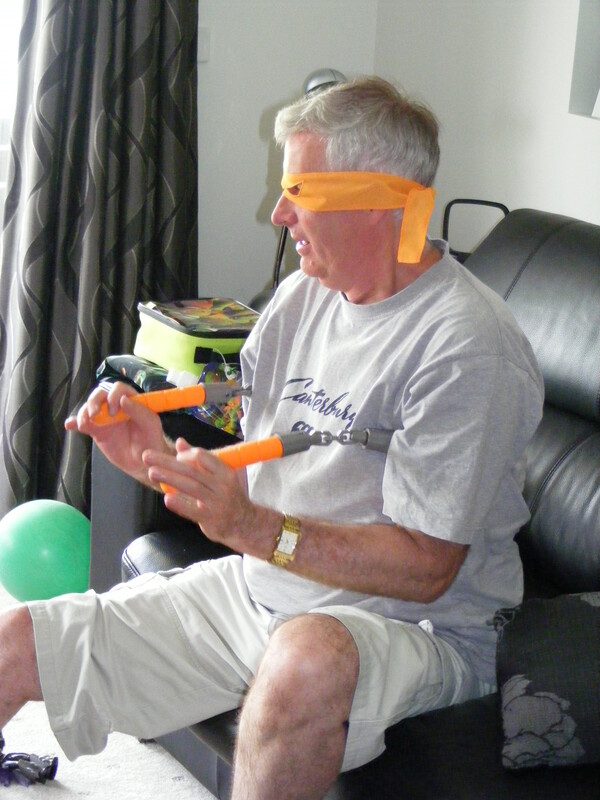 He passed on his love of silly British comedy to me, and I spent a good chunk of my teen years watching Monty Python with Dad and re-enacting our favourite sketches. These films bring back so many happy memories. More DVDs! 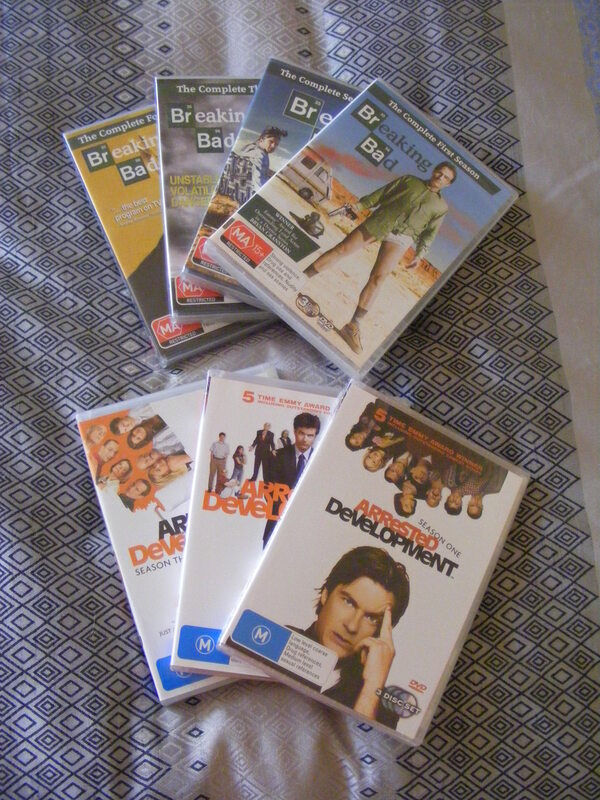 From Mum and Dad I got the first four seasons of Breaking Bad. My brother, Mick, got me all of Arrested Development, one of my all-time favourite shows. This fantastic Scottie Dog brooch was from my mother. She always picks out the most awesome jewellery for me. 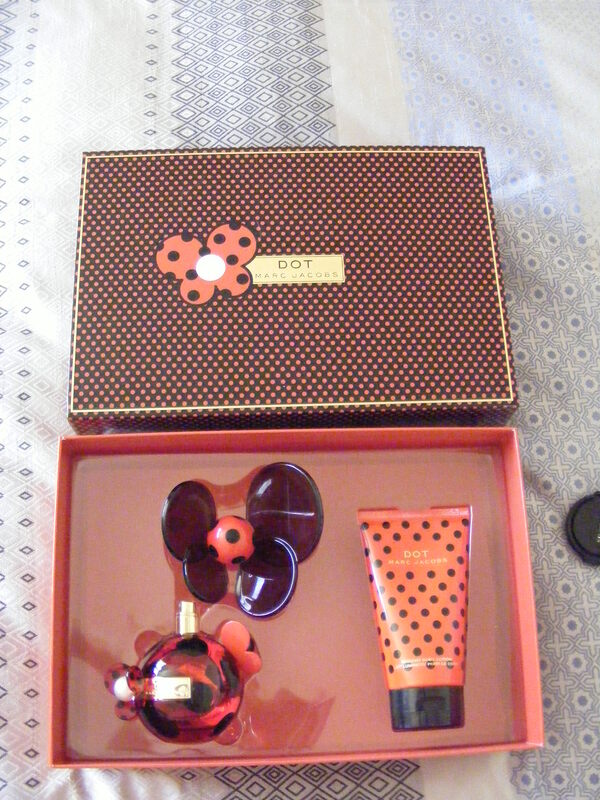 And finally a set of Marc Jacobs Dot perfume. I smelled this a few months ago and fell in love with it. I adore the fruity scent, the spotty bottle and the name. Dot was my Nana’s name as well, so I got a bit teary when I opened this gift. I had a truly awesome Christmas. I feel so blessed to have spent the day surrounded with the people that mean the most to me, with good food on our table and presents under the tree. It was a fabulous day. I hope you had an amazing Christmas too. Previous A Merry Christmas to all! Ohh! Looks like a great Christmas! 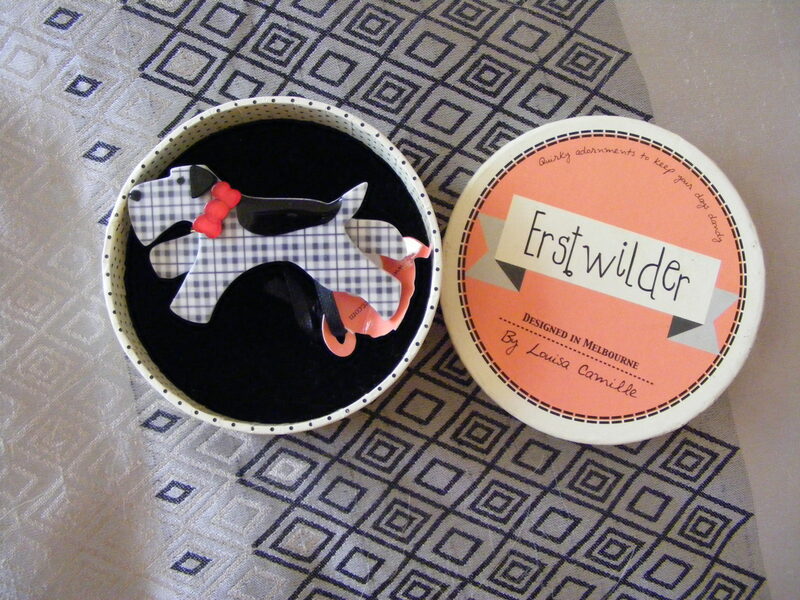 I LOVE Erstwilder brooches, I have 2 but have a whole wishlist of ones I want! It was a really great day, and I am so thrilled with the brooch. I’ll certainly be asking for more for my birthday! Looks like you had heaps of fun. I’ve tried the Dot perfume a few times at duty free. I love the packaging but the scent is not for me. It’s super cute though. It was a lot of fun. I really like fruity scents, and Dot has a very watermelon-y smell. I love it. (but it’s not for everybody).